Our classic 49er Fun living history field trip campout. 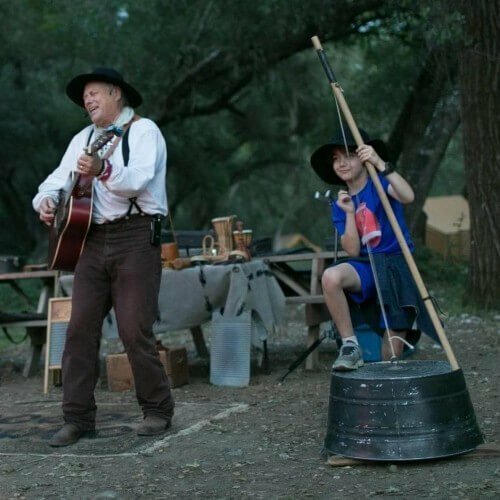 We meet each other at Gold Bug Park in Placerville California where you’ll meet our living history guides who will start to transport you back to 1854, just after the height of the California gold rush. 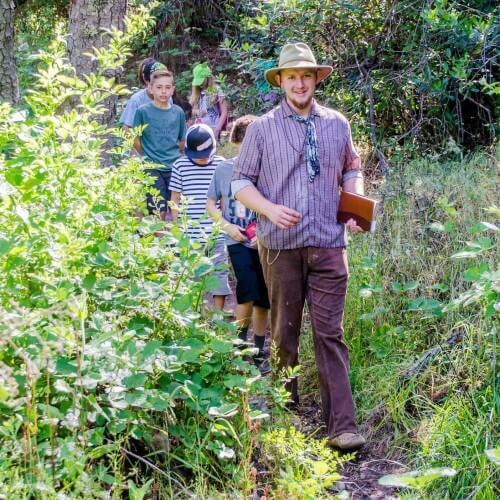 While we are there we will explore some restored gold mines as we learn about mining, play some games, and get a feel for the lay of the land. Next we’ll stop of at Marshall Gold Discovery State Historic Park. 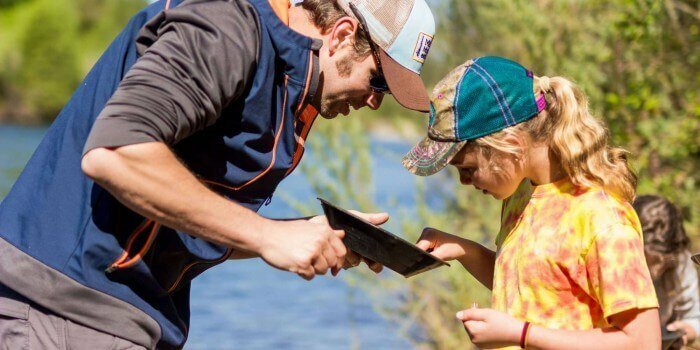 (Want a more hands on experience instead of visiting Sutter’s Mill? Try our Prospector) While we are there we will see the location where James Marshall first pulled gold out of the river back on January 24th, 1848, examine a replica of Sutter’s Mill, see mining equipment from the era, and take a few minutes in the surrounding hills for a short quiet time alone with God as learn to grow in our Christian faith. 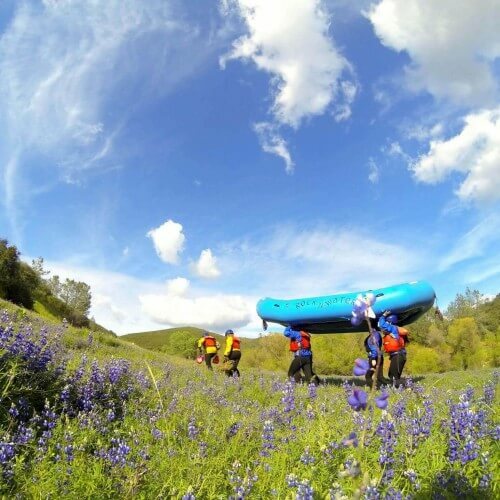 Then it’s on to our claim on the side of the South Fork of the American River (just a few miles downstream of Coloma California), where you’ll set up your shelters for the night before setting in for a great dinner. After dinner an old time band will join us for a time of dancing and singing, followed by a time of worship and learning as one of your guides shares a devotional story with you about their experiences in the gold rush and how they have grown as a Christian and drawn closer to God. After a great breakfast we’ll get our hands dirty as we experience first had a little of what it was like to live in the California Gold Rush as we pan for gold right out of the American River, make rope and bead necklaces, learn how the Maidu Indians lived off the land, play some games, and take a short quiet time devotional hike. We’ll have a little more fun, games, and learning after lunch, then we’ll gather together for some last thoughts before waving goodbye. For more information please Contact Us or check out our Mother Lode Trip Synopsis. NOTE: Please understand that Marshall Gold Discovery State Historic Park is no longer a stable resource. We will let you know if it is unavailable for your selected dates, and your trip will either be moved to a different date or switched to The Prospector. I was a chaperone for my daughter’s 4th grade class. It was an overnight camping trip. It was such a great experience! The guides were terrific and the activities were so much fun – for the kids and parents. I have to agree with others that the food was amazing!! The kids helped to clean up after the meals and I really liked that part. Our guide (Rebecca) was very knowledgeable and gave so much info during our hike. She was fun and very pleasant! Thank you to the entire staff for an awesome experience! We had a great time. Loved how scripture was woven into nearly all of the teachings. “God is greater than gold!” came through loud and clear. This was my first time attending this with my 4th grade class. It was hands down the most amazing experience possible. The kids had an awesome time as well as myself. The staff is very attentive and full of great information. The food is amazing as well. Thank you for all that you do at Rock-N-Water!! This experience is so wonderful and memorable. I was impressed with how much camp lore and tradition they could pack into a such a short time. My older students that have attended continue to have such fond memories of their days at Rock n Water Camp. My time at Rock-n-Water is always fantastic and certainly a worthy trip to make with my 4th grade class. The staff is engaging and fun. They are knowledgable about the time period and excited to share that knowledge with my students and their parents. I look forward to this trip every year. Great time with great people! They not only provided a great educational experience, but they also invested personally into the students. Highly recommend! Our experience was a great one, as always. Everything was fun, educational, and well organized. it’s always better for our first timers than they expect it to be. The best was how well God was intergraded into our entire experience. Thank you! This is a wonderful trip for schools. The staff stayed in character the entire time. The kids got a ton of exercise and experience. My daughter and I had a fantastic 4th grade trip with the Rock-N-Water folks. Even though our first day was plagued by wind, rain and hail of near-Biblical magnitudes, the staff led both students and parents with exceptional poise, demonstrating joy and thankfulness. Our guide was thoroughly acquainted with the relevant local history. Not a single one of the activities was a dud. Two thumbs up. Five stars. I look forward to several more 4th grade trips to Rock-N-Water in the next few years. Very fun! I would have liked more accommodations for my son who where’s afo leg braces and uses a wheel chair part time. He still had a good time with friends. As usual the crew at Rock N Water step up and take over. I did miss the amazing Harmonatras. What a great experience for the kids – next year’s class is already looking forward to going. Thanks for all you do! My students, parents, and I had a great time! It was interactive, fun, good food, and great spiritual connection. We got to enjoy one of your gold rush camps. I was overwhelmed by how much fun we had. Your staff is amazing and did a great job teaching all of the fourth graders. I would recommend this camp to anyone! It was wonderful. My daughter and I enjoyed it alot. I think the activities were well organized. We loved the night activity with the music and dance. It was super nice. It was horrible starting from the direction the school gave us with no address, to the staff asking us to do idiotic bonding crap after most of us drove 3 hours, to the hiking that was never specified, and which kids were miserable. Awesome experience and such knowledgeable staff. Thank you for the great experience for my student, chaperones and myself. I would highly reccommend this conpany and experience to anyone. My experience was most positive and overall excellent. 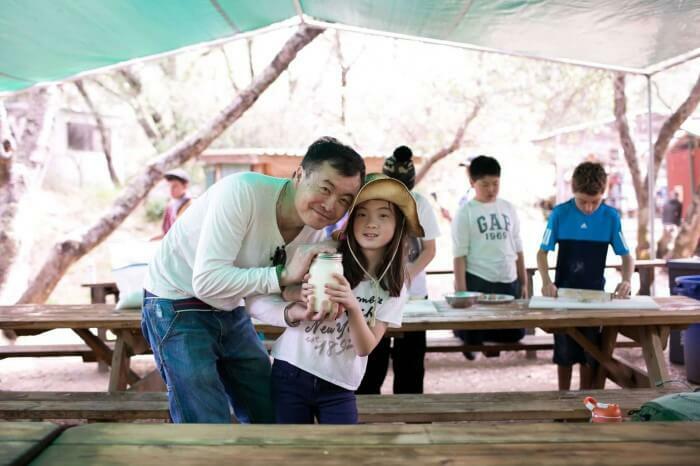 My daughter and I would definitely come again as we found that our time was spent doing many activities that were interesting and fun for everyone. The staff was very very nice and we enjoyed our stay. Thank you so much. Excellent experience! Emma, our guide, was knowledgeable and fun. The students had a blast and talked about it a lot. Amazing. More than I ever expected!!! The staff was wonderful, friendly, and knowledgeable. The food was delicious. The activities were good, but I would have liked to have had more information about what we were going to be doing ahead of time. The hike on the first day was long and I noticed that many families did not bring their water bottles along for the hike because they did not know it was going to be as long as it was. I would have also preferred less time hiking as that is easy for families to do on their own. I thought there were going to be more group activities and games. I did like the short hike on the second day and the encouragement to have a quiet time for prayer and reflection. Excellent. You folks did a great job! Junior was a great guide – he shared a lot of interesting information and was well liked by all. Food was excellent! Campfire entertainment was such a fun and engaging experience! Would definitely recommend to everyone!! it was a life time experience great adventure wonderful guys in charge!! Junior, Emma Anna and their family are the main reason of my total satisfaction They no only are a great guide they also change our lives by giving us the word of God!! Especially appreciated the time given for young people to commune with God and nature. Enjoyed every minute of it! The staff was courteous and very intelligent with all their information. The staff worked very hard! God bless them! Our kids will remember this trip! Fun and exciting oh and we learned a few things. This was our second year and we really enjoyed the trip. We love all the interactive activities, food, and fun that Rock n Water provides. We felt the parents were better engaged last year then they were this year. I would just recommend the leader try to get the parents more actively engaged from the beginning like it was last year. We always enjoy our experience at Rock N Water and look forward to next year. Very good. I’m not a camper person but I appreciated the area, the activities and the food. It provided a chance to go back to the time when technology did not exist yet. And felt so close to nature and appreciate God’s creation that we neglect sometimes while we struggle to our current life settings. The only thing that I did not like is that there was no one cleaning the experience chamber. Other than that, it was a great experience. Thank you! The trip was magnificent. My son and I had a great time bonding together and making lasting memories. The staff was great and helped us soul search and bond with God. We met a lot of new friends. We kept busy with all types of bonding activities. The place was clean and the food was great. Nothing like a simpler life sleeping under the stars in a tent with love ones without the electronic distractions. Thanks for this cherished time. Great fun for our Fourth Grade class. Well organized crew and smooth program. Unforgettable campfire experience. Highly recommend it! Great overall experience for the second year in a row. Our host were wonderful. The band was a teacher and student favorite. However, I think we rather do a full day trip next year instead of the overnight. Not because of anything that happened, but because it is just too many moving parts for to plan for. I enjoyed everything about the stay! Thank you so much. Fantastic trip! Full of learning and exploring for both kids and adults. Wonderful staff, food and scenery for this city family to enjoy. Great. Kids had a great time. The instructors were wonderful. I would definitely recommend it. I loved it! I was a bit worried about doing an overnight field trip, but everybody involved made us all feel at ease. The kids loved it and I can’t wait to go again! I really enjoyed the time with my daughter. The leaders were knowledgeable and fun. I thought it was a great experience for children and adults. I am thankful for the reality of God’s plan and involvement in our lives being the focus on so much of what was discussed and lived out. It was a great opportunity to show our children in another setting that God wants to be a part of our every day lives.Amazing grace shall always be my song of praise, in Christ I died, am not condemned, co-raised and seated in the heavenlies! God bless! Had a great time! Staff was great, food great, kids and grown ups learned a lot! It was a very lovely experience and everything was great. I have been to your site before with one of my older children and I’ll be coming back again with 2 other younger children in the coming years. I enjoy this trip with the kids and the overnight camping for them etc. I think you have the right balance for them and this works out fine and is fun for everyone. It was pretty much the same as the last time I came and I don’t think I would change anything on your end. The only thing I missed was the printing press where the kids made cards. I thought that was really nice. The only complaint would be that the mosquito’s were really bad this year and were just everywhere. Not sure how you could cure that but it was bad because of the wet year we had. 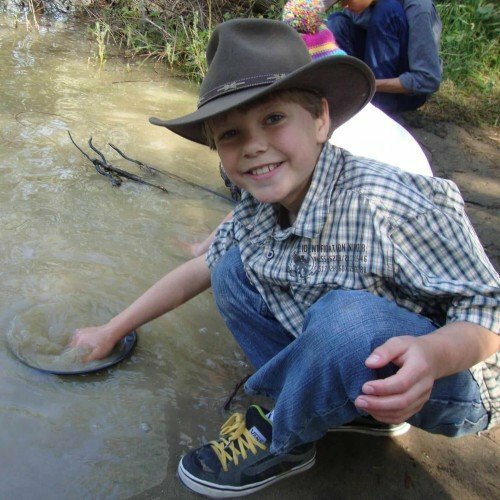 Improvements might be a bigger area for gold panning. I know the river was also high this year so not sure if that works. Keep up the good work. Enjoyed the history aspect of the trip! The campfire music was great. It was very good. I would suggest you make sure people know they need protection from the mosquitos (including a tent- the idea of sleeping under the stars is nice but not practical, I was eaten alive, came home with at least 12 bites in spite of using repellent). The night campfire was an AWESOME evening, so much fun and so funny- it did run a little late for the little ones, though… and a plus would be to ask the kids for song requests in the end segment- a lot of them didn’t know the songs being sung, but they have favorites they know really well and different schools could share with each other if they don’t know each other’s songs. The guides were so nice and ours, Rose, was so very sweet. We just adored her, and so did the kids. All of the crafts events were perfect for the kids and their attention span. Good message, and well delivered. Overall, great time! THANK YOU! We loved it! The guides are all wonderful and the evening entertainment is absolutely fantastic! The children certainly enjoyed all of the many activities. I felt the councilor led times of reflection and meditation were very well done and beneficial for all. Wonderful bonding experience with my son! 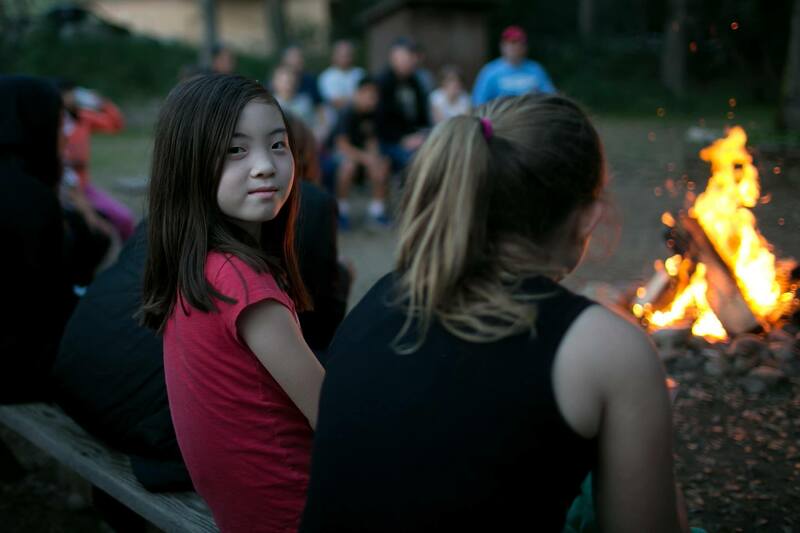 The Pros: Atmosphere, Camping, Campfire, River, Mines, Panning, Parking, Team Leaders & Staff, Hiking, My Childs Smile. The Cons: Never knew what we were doing or doing next. Felt rushed thru the different activities, Food was limited, Food was non-eatable due to I don’t eat CHILI with ONIONS, neither does my child. Suggestions: Slow down and let the activities take place. Offer PB&J as a food alternative. During activities hand out laminated facts about the activities. Provide an agenda to the parents. 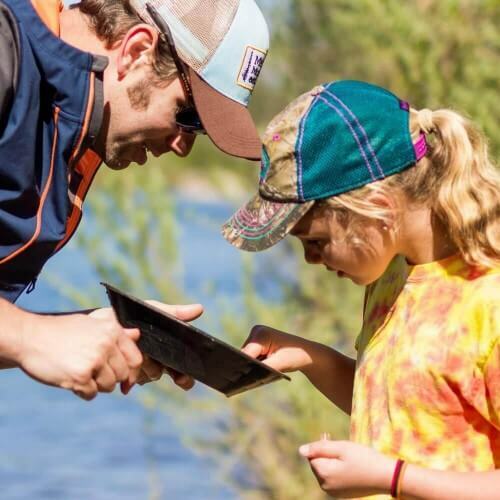 Our fourth graders and their parents had an amazing experience on the Mother Lode trip. The tour guides were kind, the adventures were fun, and the food was amazing. My son and I enjoyed the program a great deal. Good food, informative and well coordinated. I attended the 49er camp with my 4th grade son and his class. The staff were excellent. They were friendly and organized. They rarely, if ever broke character. The activities were well planned and educational to give the children a glimpse of life in the 1850s during the gold rush. I would highly recommend the camp. Absolutely amazing. I loved every moment. The activity schedule was full but doable. I was exhausted by the end of the day. So grateful I was able to attend. Our experience this year was good. There were a few bumps here and there. Our guide did a wonderful job but really struggled to give us information about a lot of the landmarks on the first day of the trip. There were also some time management issues which prevented us from visiting the Marshall Monument(bummer!!!). But overall, the trip was good and my parents really enjoyed it. We will be back next year! We had an excellent experience. Everything was very organized and the food was delicious! Would definitely recommend to a friend and am looking forward to our next trip! 10 stars! Can’t say enough good things about this camp. Especially our fearless leader Emma! A great educational experience for kids of all ages even grown up kids like me. I thought it was a great experience for the kids and parents. Spiritually, history, good clean fun. Best of all no electronics. The staff was very nice and made the camp fun. Great activities. It was a good experience. I learned a lot about the gold rush and my son liked to see where it all started. Miss Lou was a very good leader for our group. Amazing staff! Such a stressful and long days, and they were always smiling. Wonder how they do it!!! I am sorry it took me so long to respond. The experience that I had was awesome. It brought back memories of my childhood church camps during the winter and summer. The entire trip was loaded with so many different activities and yet never felt like to much. The knowledge shared as we hiked through the gold rush era, down into the mines, and amongst nature was very nicely delivered. At least in our group The perry-winkle fuzzy foxes of doom. I enjoyed the story telling, the display of juggling I cant put into words other than the man has mastered his craft. He did so much more. Even though it was locked at the time with a small amount of begging I was aloud to enjoy one of my all time favorite things to do which is rope swinging. Well having said all that. I still need to say one last thing, and this tied everything that happened at the camp together. From start to finish. That was your cook. My wife is an excellent cook with spices and never letting meals get boring and your cook was just as good if not better. Every meal was delicious, with each ingredient tasting clean and boasting great flavors. I did not expect all the things that I got out of the camp!! It was definitely like going back in time–very refreshing in today’s tech. world. The children loved just running and playing in the trees. Maybe a little more free time or physical activities. Add some seating at the areas where explanations are being made. As a grandparent on the trip, the “standing,” was most difficult. Our 4th grade students have been attending Rock-N-Water camp for several years now. It is a trip that children look forward to each and every year. The staff does a fantastic job of making learning fun, interactive, exciting, humorous, and God-focused. We anticipate going to Rock-N-Water for many years to come! It was a wonderful experience.The food was delicious,staff was friendly and provided a great learning environment. We had a very refreshing and amazing time in Roc N Water. Loved the hospitality of everyone. The games were fun and the messages from the Bible with prayer time was very encouraging. Loved the quiet time the best where I could just reflect upon God during that short time of quietness in the beauty of his creation. I really enjoyed it, the staff was great. I really appreciated the quiet time during our hikes. It was cool to have the kids participate in that. We had an awesome time on our School field trip with Faith Christian fourth graders. The staff was great, our guide Liberty was amazing and the kids loved it. I loved every minute that my daughter and I spent at Rock N Water. I love that the guide stayed with our group the whole two days. She made the whole experience amazing and focused on God. The camp was so beautiful. I thought the 49er overnight camp was a great experience for both the students and chaperones alike! The tour guides were amazing in their knowledge as well as their ability to connect with their groups. We spent most of the time with Junior, and I am so impressed at how engaging he was and how much information he was able to impart to the students. They definitely went above and beyond to provide an enjoyable and memorable experience! Not only did they make it fun and exciting to transport students back in time, but it was evident that they genuinely cared for the students and adults that were visiting. I also was very impressed at how tasty our meals were while at the camp, and how well we were accommodated with our food allergies. My daughter and I cannot have gluten and are used to having less than appetizing options when we eat out, however we were so glad to say that we loved the food offered us at Rock-N-Water! I am so glad I was able to attend this camp and I have been telling everyone I know what a wonderful place this is! Thank you! Most amazing experience for myself as an educator and for the students! Can’t wait to come again. The students loved the trip. It will be a treasured memory of their elementary years. From the start the staff was friendly and outgoing. Throughout our adventure each one of the team leaders brought a unique style and character with them. The learning material was fun and the hikes on the trails were amazing. A lot of our kids had never been in the mountains before. Some had never even been in the river. 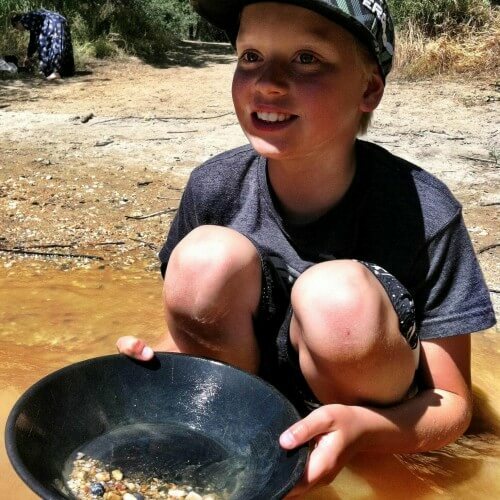 The only thing I would change is the amount of tine the kids spent gold panning. The kids were reluctant to leave water so quickly and as I understand finding gold is a fluke (I actually found 3 gold flakes in the sand from my river shoes when I came home) the trip was centered around gold. I know there are some regulations with mining certain ways but a working off river slouse box would be an easy and fun thing to show kids, we could make them fetch water from the river in small buckets to pour over the dirt. I think the program is an important part of our history as californians and I hope it has many more years of service and dedication. Thanl you for letting us be a part of it. Ana was our tour guide and she was amazing. It was a wonderful trip. The staff was extremely knowledgeable, fun, and very charismatic with all the children. I would definitely recommend. Excellent hands-on learning experience. Staff was engaging and kept to a very tight schedule, which I appreciated. I would have liked a heads-up about what to expect and not be kept completely in the dark. A full detailed agenda is not needed (in order to keep everyone surprised) but an outline for the parents of the daily activities would be helpful. It. Was very fun and educational. The people that work there are very friendly. It was a once in a lifetime experience for us personally. I have been working on cleaner eating and exercise for which there was NO lack of. You are well organized as a group and there was never a moment of boredom. I could barely move for a few days due to sore muscles but I needed it and my son was resilient as most 9 year olds are. We had an awesome expirence with rock n water. We look forward to next year’s trip. Great all around experience. First time I can remember my son now uttering the words…”I’m Bored” great bonding without electronics or the busy city life. The connection to nature was the best part. We were there for the 4th grade camping trip. It was incredibly fun for the kids and they learned a lot. The food was great and the itinerary was full of fun activities. The staff was incredible and never once broke out of character. It was an amazing field trip that will have long lasting memories for the kids, parents and teachers. I’m so glad I was able to accompany my daughter. It was amazing. We had a blast. The adults and the kids really enjoyed the experience. I’ve been two times now and each time was fabulous! The only suggested I would make is to be more allergy friendly for those with dairy/egg allergies. One of my sons classmates was unable to eat most meals due to cross contamination (other kids went before and dropped dairy onto the food) and each item having dairy. For example, breakfast on the day we left was potatoes with cheese on them, eggs, and peaches. The only thing the child was able to eat was peaches. Lunch was better because they let him go before the other kids and he was able to have a sunbutter sandwich and fruit. Other than that it was truly a unique experience and I’m sad I don’t have any younger kids to go with! Overall our group experience was great. Your staff are very knowledgeable and made us feel welcomed. I had a great time. I know that the students really enjoyed the experience and I look forward to going back next year when my other son is in fourth grade. The staff did a great job! Enjoyed the experience and the staff very much. Food was above average and the content and message was very good. Not everyone, though, knows how to enjoy camping. Thanks for your ministry! Great time and great experience for our children. 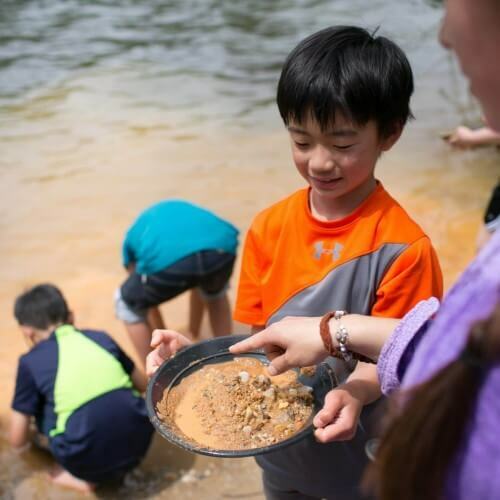 It gave them the opportunity to take part in things they normally wouldn’t to include visiting a gold mine and gold panning in a family friendly atmosphere. It’s been about seven years since I’ve last been to 49er Fun Camp, but it’s as outstanding as ever—if not better. (I used to attend when I was the 4th grade teacher, before I became principal.) Filling in for my 4th grade teacher (who just had a baby), this year marks the tenth year that I’ve enjoyed your CA history program. Way to go, Rock-N-Water! Keep up the great work! Our school had a great time! Our leader Emma, was wonderful. So knowledgeable, patient, fun, interactive with the kids. Your camp offered delicious food, well organized and never a dull moment. There was always an activity planned. We enjoyed the camp fire and singing as well. We had a wonderful time. Thank you! My son and I have decided between school field trips taken and Pathfinders trips taken, Rock-N-Water was the best yet!!! Loved everything about it and people were super nice!!! And they did a great job!!! Great time! Great staff – perfect for kids! I’m happy to say the staff at Rock-N-Water and the experience they give their guests is as remarkable today as it was when I was in high school. I had the pleasure of attending their “49ner” camp with my 4th grade daughters class this spring and was pleased to find the staff still knows how to entertain and educate students in our countries history and God’s creation. 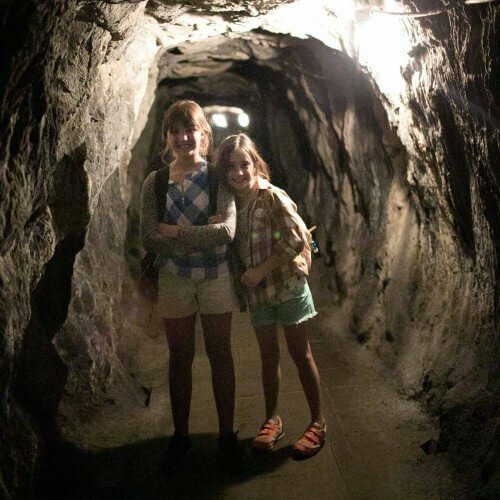 My daughter and her friends are still talking about the adventures they had in the Gold mines and at the camp in Coloma. I’ve often told others of the week long camps I went to there while in high school and the emotional and spiritual growth I experienced, not to mention the great memories of river rafting, rock climbing, cliff diving and back packing. If there is an opportunity for your family, class or youth group to spend time with the people at Rock N Water I would highly recommend putting in the effort to make it happen. It was a great experience for both my son & I. While he was very hesitant to camp (being hiso 1st time) and participate (because he is too cool) he laughed, had fun & learned many new things. He even asked if we could go back again – and we hadn’t even left the parking lot yet. The staff/guides were amazing too, very knowledgeable & friendly. We had a great time! It was our first time and was very impressed on how organized it was! My son and I had a wonderful experience. The staff at the camp were amazing and so friendly. We learned a lot of new things and enjoyed the hiking, music, and food. I would highly recommend this experience to all. I loved everything. Great people, great history, great food. My 10 yrs old son is in love and eager to go back. My daughter and I had such a great time. There were constant activities so we were never bored. The staff was great with the kids. We came with our school group but I would love to go back with my family! I was impressed with the balance of activity, learning and application of bible stories to each activity we did. I was also impressed with the meals. The food was delicious and I loved the fact that my son was able to help wash dishes. We both enjoyed this experience very much and I would recommend it to everyone. Our experience with your camp was nothing that I was expecting since it is a Christian camp. I was expecting to have religion shoved down my throat when in fact, it was the total opposite. This was one of the best experiences I had but, more importAnty, it was a chance to share this with my daughter. Something changed between her and I and the bonding was awesome. Sonny was our group leader and he is THE BEST!! A genuinely nice and patient person who claims he loves his job and it is so great when you actually enjoy your job, because it shows and puts people at ease. He was so knowledgeable and informative. My favorite activity was sitting inside the tee pee, making bracelets with those JOB’S TEARS and how Sonny told us the story behind the “tears” and referred to the Bible story of Job. It was so interestingMy daughter is still talking about the trip. Thank you! Thank you! Our experience at Rock-N-Water was absolutely amazing!Sonny was our group leader;he was extremely knowledgeable,passionate and patient.I also need to recognize the kitchen crew;they never missed a beat,their service was flawless,and the food was better than expected.Your organization and staff are the best! It was fine. If we had an outline of a schedule it would help us to prepare the kids. Some times the activities seemed like they were just ways to kill time. I really enjoyed my time. The kids loved it. I could really tell that everyone who works there has a tremendous amount of faith and loves what they do. It show in their interactions with the children! I look forward to returning next and a few years after that. I have two more kids that will come your way. Overall ot was good. I have been now two years in a row, and I can say it was pretty different this year. I feel the leaders/group guides need to me much stronger. I don’t feel each group had the same experience. Some of the leaders seemed very new and not able to keep the group’s attention. The lunch this time was not very good; last year the pot pie was much better. I do like how Christ is tied in to a lot of the experience. Had a great time! It was my second time there and enjoyed even more than the first time. Loved it! Overall it was a great program. Sometimes moved too quickly and sometimes moved too slowly. I liked the Christian emphasis however sometimes our leader went on too much/long about biblical principles and stories for the attention spans of our 4th graders. She was going to get her message out without reading the audience for clues about boredom or over-saturation. Thanks a bunch! Our guide, Ajudy, really poured out the love of Jesus and the gospel message to our crew. We thank God for the timing of the rain, as it did not prevent our participation in all the activities. Very clean. Smart,kind staff. Great musicians! I enjoyed the history and biblical context of this wonderful experience. This was a wonderful Christian family experience. Awesome experience. I really enjoyed the scripture and biblical/life lessons shared with the kids and parents. Eva and her mom Judy were amazing. It was informative, fun and included exercise which I think was good. I loved Miss May! She is a sweetheart and I loved how she added God and his word into many different situations. We loved our experience! It was a great, very professional, fun experience. We loved the people who were there to help us, who were wonderful Christ centered people. They made it spiritual, educational and fun! Thank you for all you did! 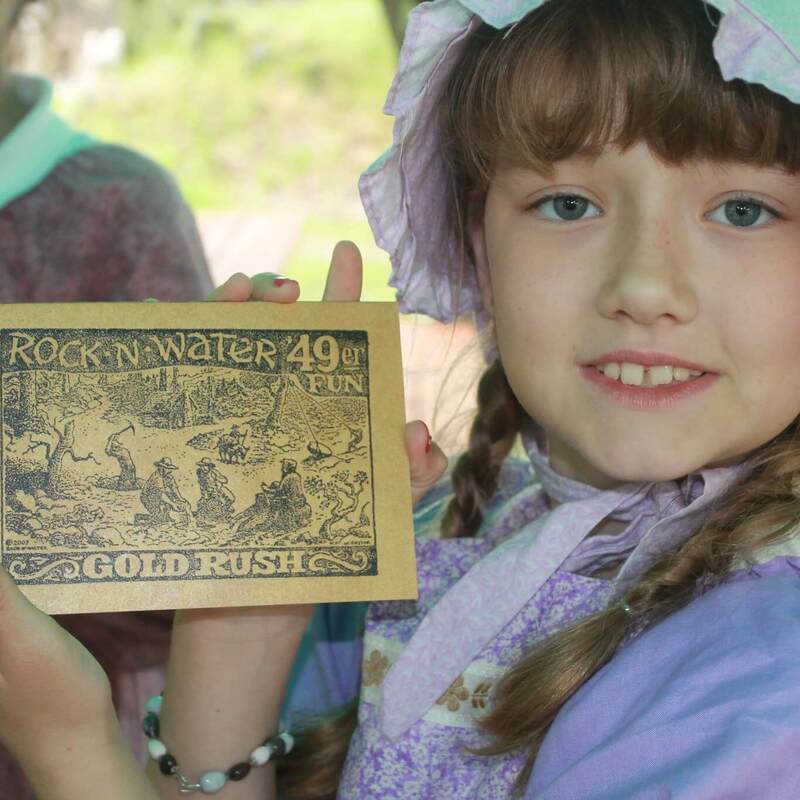 Rock-N-Water Christian Camp provided a very memorable and educational experience about the Gold Rush in 1854. Our main guide, Jess, was very informative and charismatic with the kids. The quiet times were very helpful for us to re-connect with nature and with God. My only feedback would be that, given all of the activities, this trip should have been a 2 night experience so that there isn’t a rush to do everything. Wonderful experience for both my daughter and I. Superb Staff..Jessie and Emma!! Thank you and God Bless!! The experience was awesome! It was like being at an all inclusive resort, except camping style of course. It was very nice having the Rock n Water staff guide us the whole way, we learned about our nations history and culture, while being entertained.The staff was always on point and never detoured away from character. I will definitely recommend Rock n Water. My daughter and I had a really great experience at Rock-N-Water. Mrs May and Lola Bear were our guides for our group, and we believe they are very knowledge. We had such a great time with them and would like to say thank you very much you all. We had a wonderful time at Rock-n-water. I felt it was an educational and enjoyable experience for kids and adults alike. Entertaining and educational!!! Kids had so much fun. Thank you! It was fun and well done. One of our best experiences ever. The people who ran the park were awesome and I can’t say enough about the experience.Their staff was top notch,extremely helpful and great interaction with everybody throughout the experience. We would love to go back again at some point in time. We had a great experience with Rock-N-Water for our class trip. My daughter and I had a great time with her school grouop. Honest to goodness folks, food, and fun. Loved it! Love the high adventure and most of the counselors were great! The high energy and ability to engage the kids was exceptional. It was fabulous, organized, inspirational and filled with knowledgeable adventure. Loved the experience with our 4th grade class! This Christian camp was such fun and a great learning experience!The staff is exceptional! I have brought my students to 49er camp for 8 years now. It is so well done! The students love it, and I look forward to coming year after year as well. It is the perfect end to our study of California history. I have always greatly enjoyed my time with you and appreciate the wonderful job you do. I pray the Lord keeps you safe and gives you an amazing year!